When thoughts are dull, days are cold and pleasures scarce, it’s always the food we turn to for comfort. There are days when even the idea of having something virtuous like smoothies, salads and fruits makes you want to launch a crusade against health food, you turn to sustenance. Hearty, innocent, full-bodied food that’d make you tuck in like a tapeworm, food that’d make you cry with joyous tears. 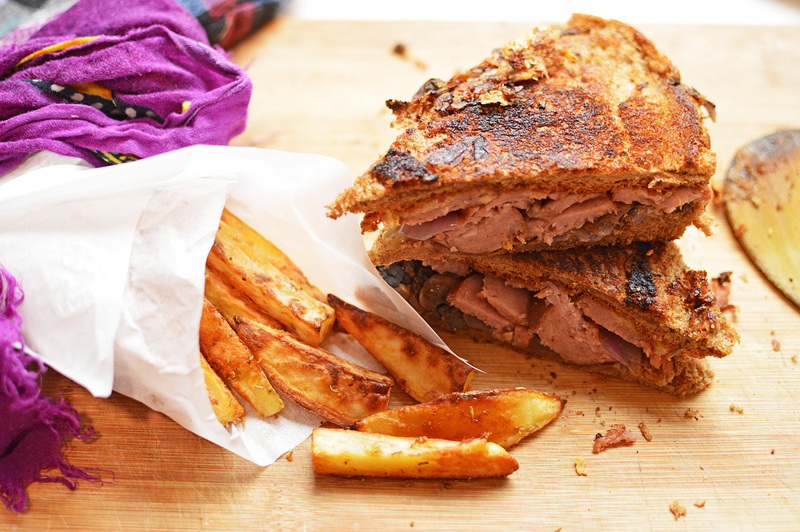 This sandwich is the stuff that voluptuous dreams are made of. It’s the kind of food you’d want to have after a night of crazy drinking or a joint too many. 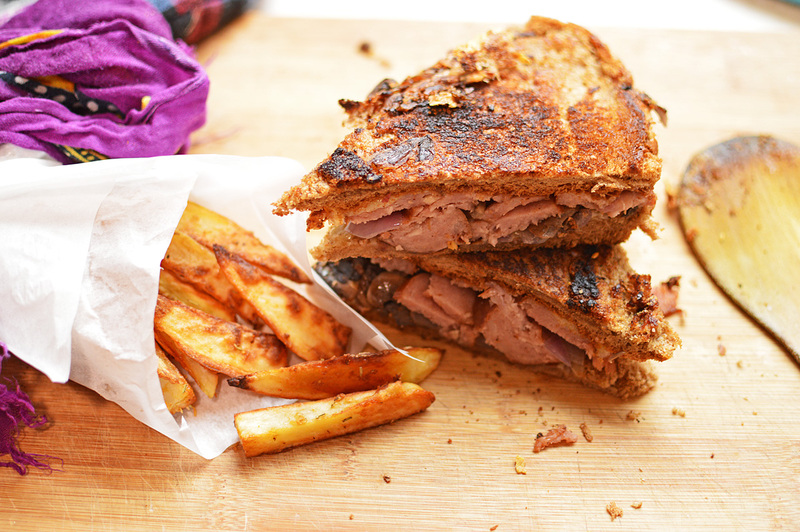 For days when you want to carelessly binge, for moments when you want to feel fueled and for times when you have the munchies for planet portions of feel good food, this sandwich is a life saver.. and it’s easy enough to throw in a matter of moments. This is a pretty versatile affair. 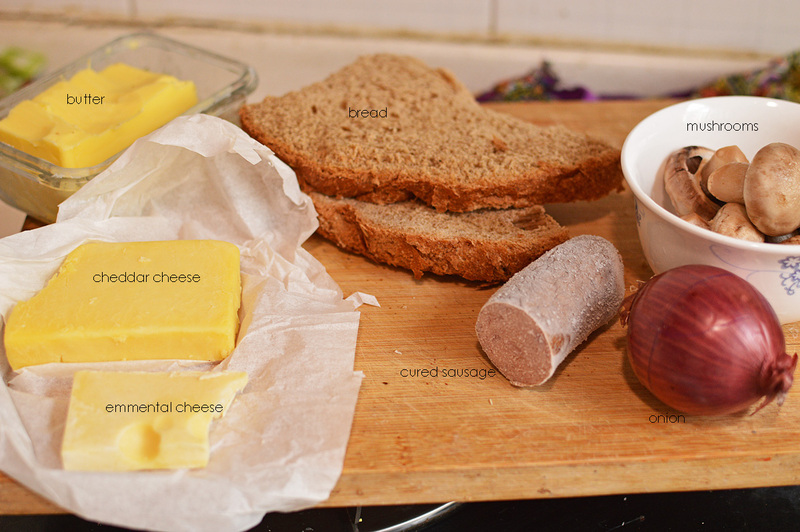 You can stuff it with whatever you want, but I did mine like so… butter, cheese (emmental & cheddar), cured sausage, onion, mushrooms & bread. Now before I start this, I’d like to mention that this is just my version. 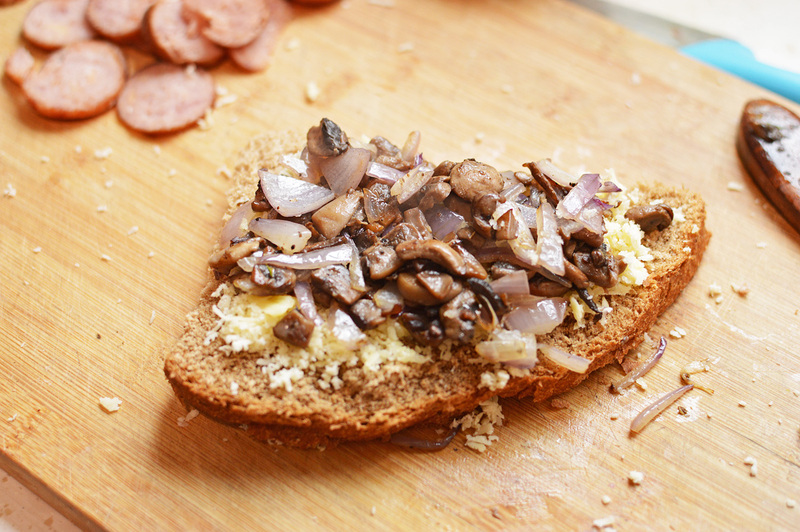 You can make this anyhow you want, using whatever cheese, whatever meat, whatever mushrooms, in fact whatever whatever. Just make sure its got plenty of meat and cheese and butter. 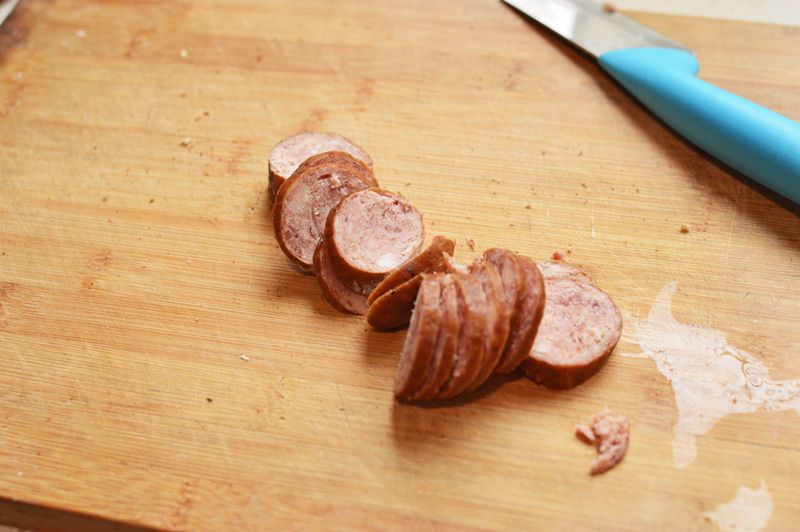 I started with the sausages and sliced them like so. into a hot pan for a few seconds just to let them warm through. These are cured so they don’t really need any cooking. That makes this recipe so much easier. Now very carefully because this step call for being an incompetent chopper, chop your mushrooms. 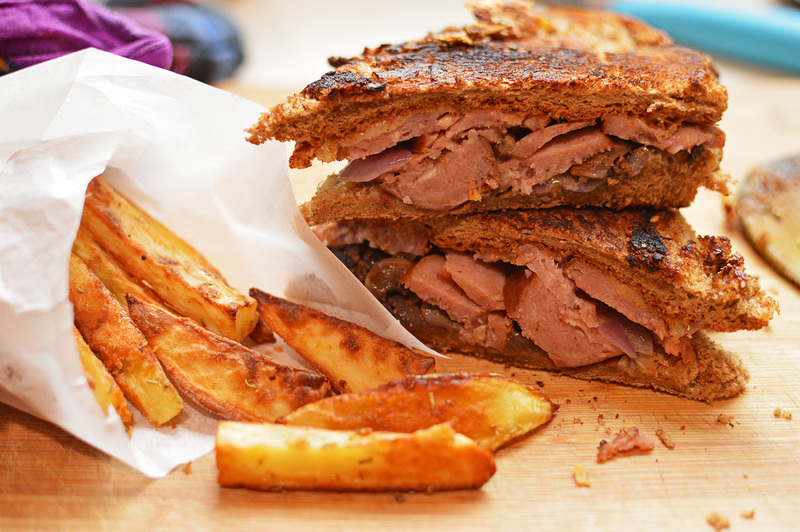 Be very casual about it, because it’s not a gourmet sandwich meant for a Michelin table. 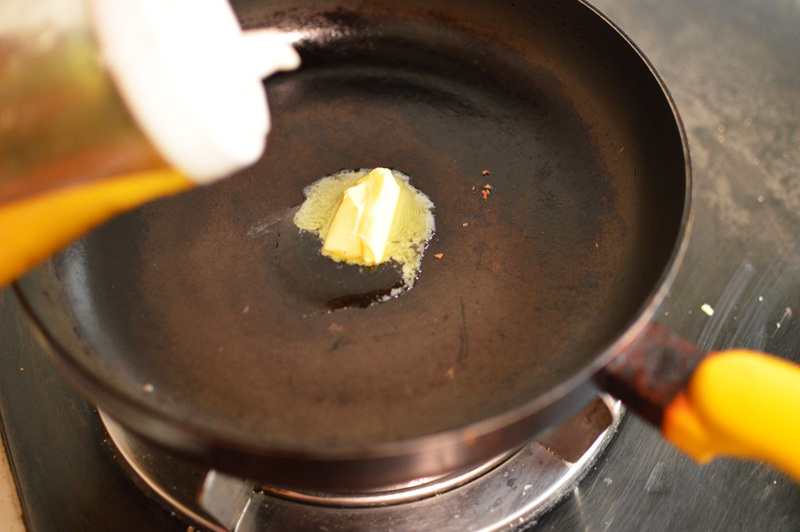 In a pan or skillet, heat a tablespoon of butter along with some oil. 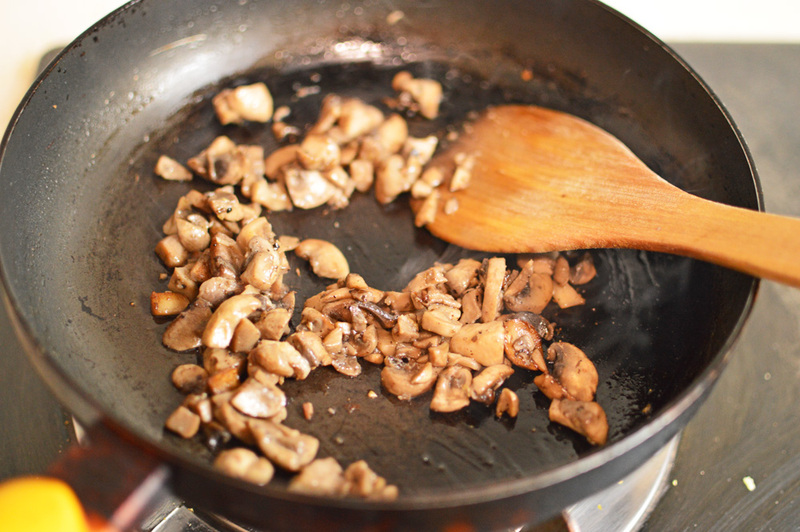 add in the mushrooms because we want to cook them and turn them brown and get rid of their water. We don’t want a soggy sammy! while that’s cooking away, in a similar incompetent fashion chop the onion. Make sure there’s nothing pretty about it. check your mushrooms. add some crushed black pepper (entirely optional) but oh so good! 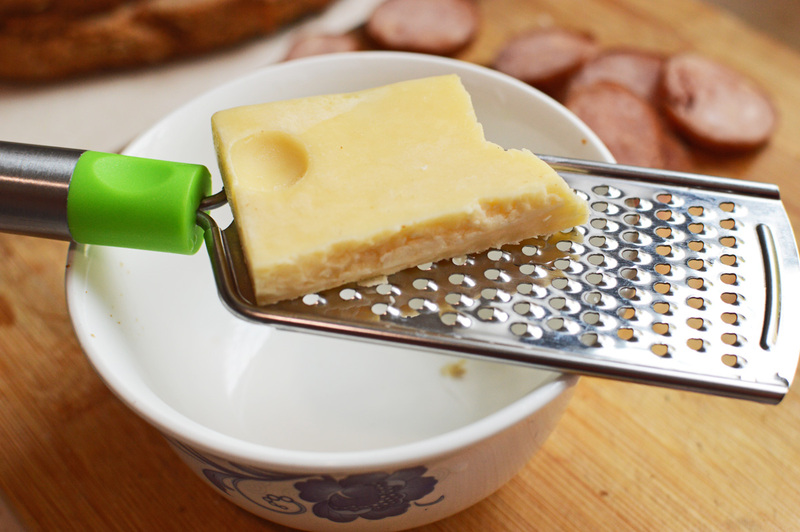 while the mushrooms are cooking up, grate your cheeses. 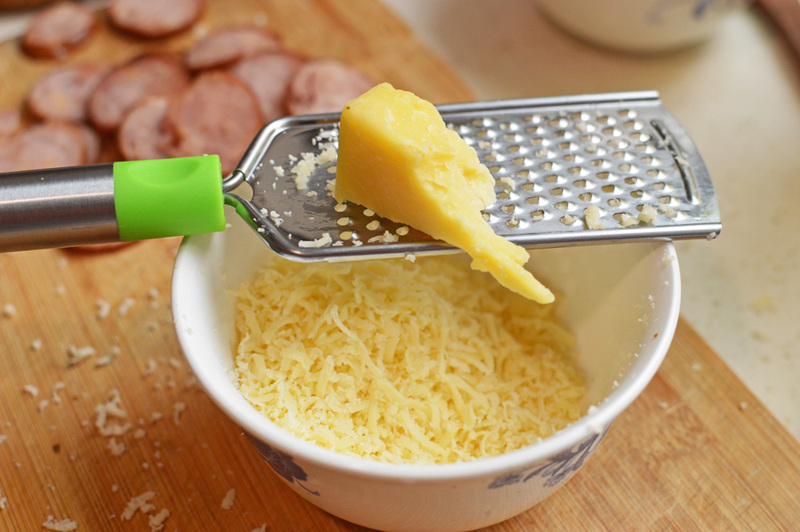 In hindsight I realized I should have used a box grater because it took me forever to grate this but it doesn’t matter, the important thing is grated cheese. checking the mushrooms they looked good and almost done. 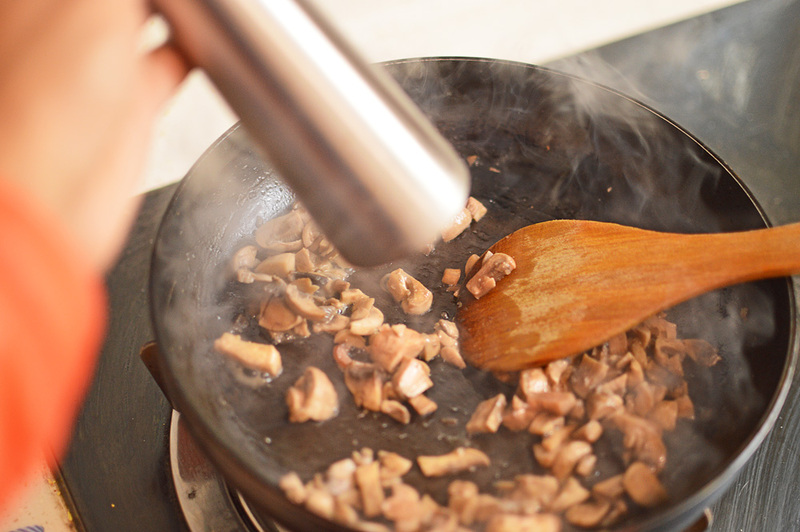 add in the onion and just stir it in the mushrooms. 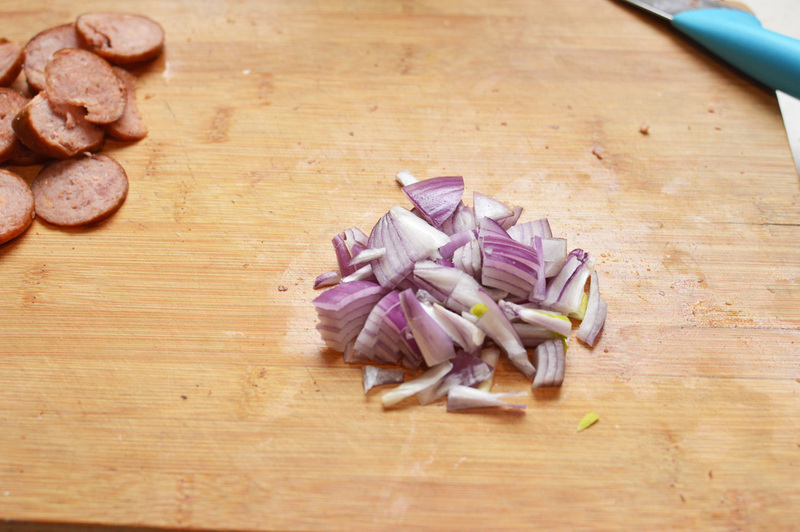 We don’t really want to cook the onions just slightly soften them. This step is done. 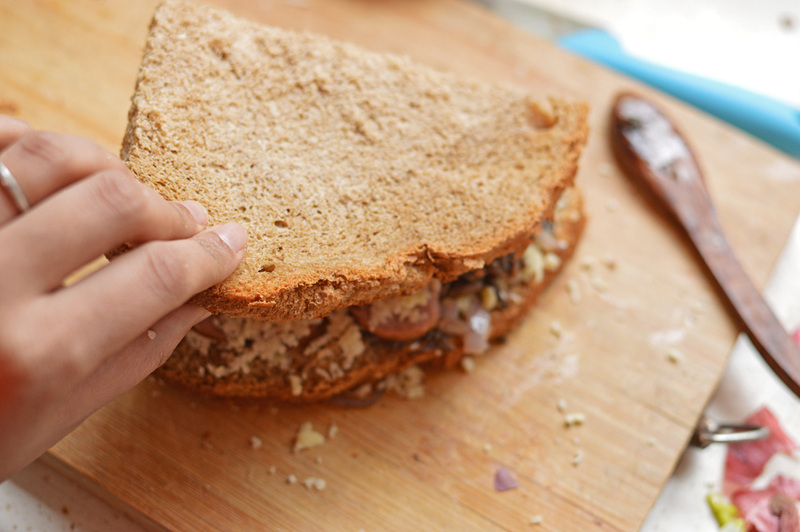 This step is essentially building up your sandwich. 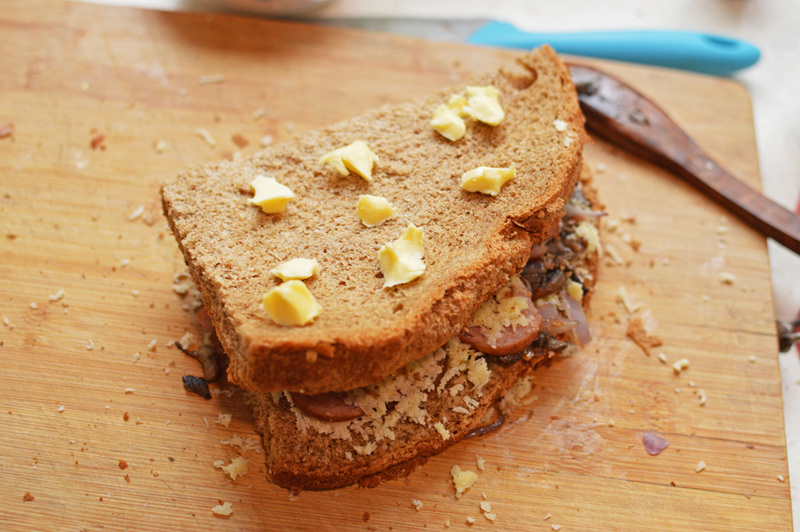 I have here some hearty brown bread ( I don’t know why though), but use any bread you prefer. Pat it down so that it doesn’t bulge up and form a hump. 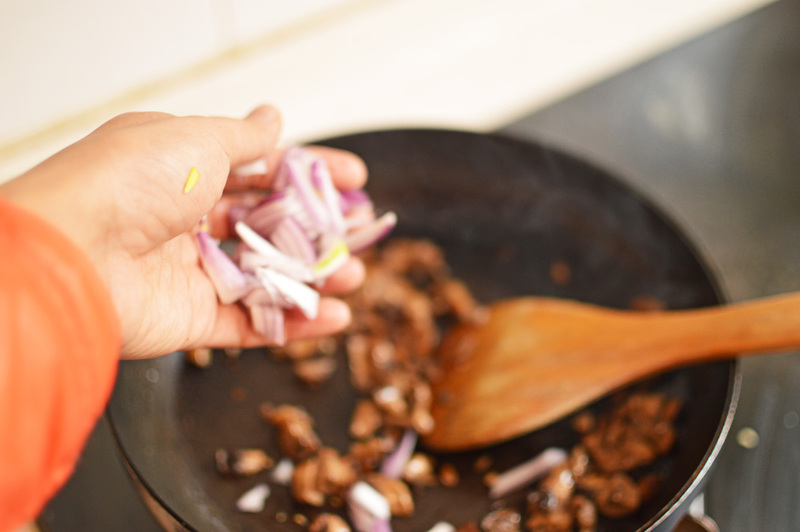 then layer with your mushroom onion mixture. like so.. and sort of flatten it a bit to prevent a dome formation. 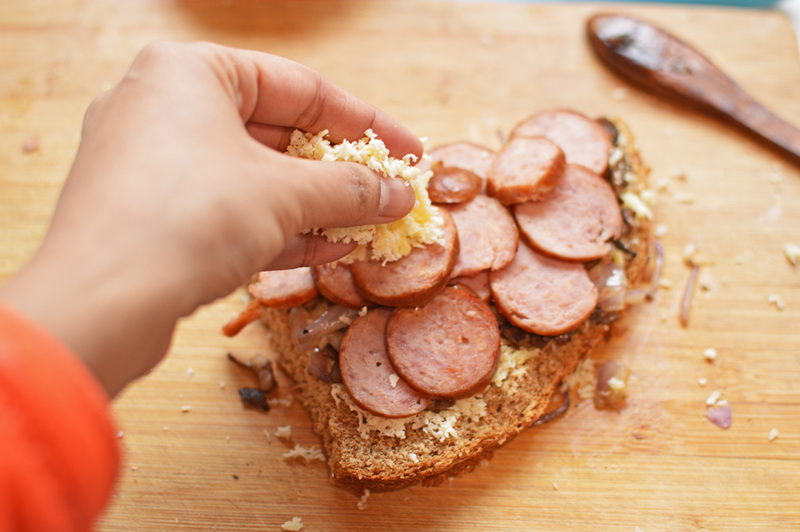 layer your sausages and while layering I realized that the sausages were a lot more than the rest of the ingredients but you shouldn’t let trivial things like these matter, so build away. Finally top it with the remaining cheese. Gently place the other half of your bread on top if this structure. 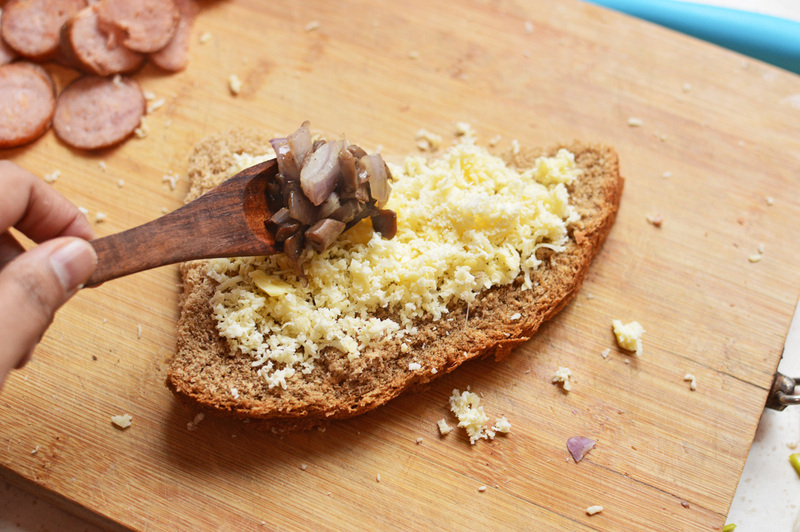 Press down a bit, but honestly if you stuff your sandwich to this point some meat or cheese is bound to ooze out in the most gratifying way. If you have softened room temperature butter then please violently slather it on your bread, I however had very cold butter which I simply dotted all over the top. 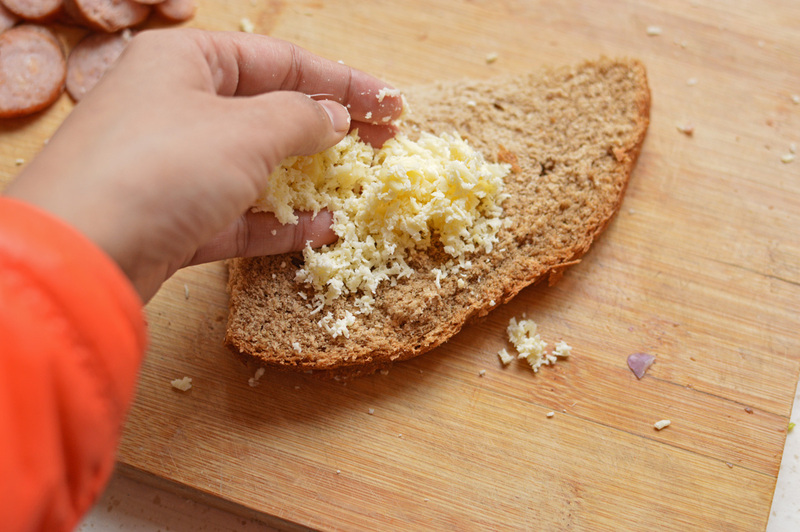 place your bread on it and move it around a bit to let it absorb all the butter. Once you feel it’s done from the bottom, carefully flip it and cook the top side. There might be some spillage in the process but i don’t think it matters. 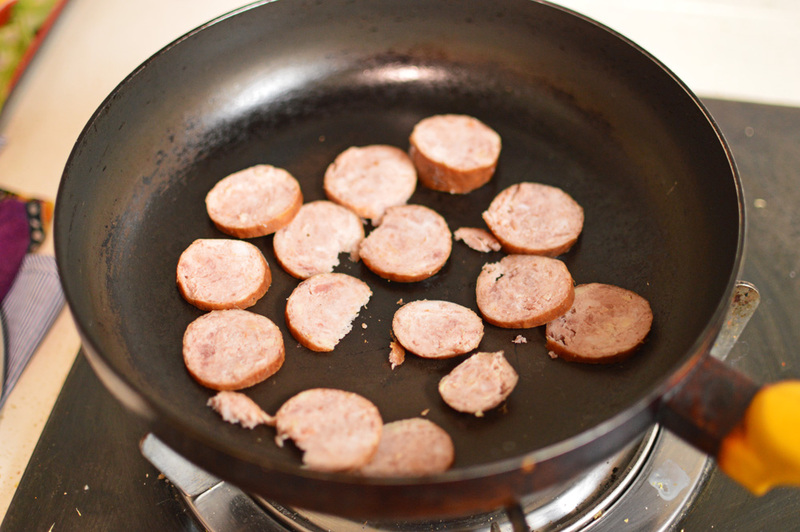 Recipe: dice the sausages into pieces and let them warm through on a hot skillet. Keep aside. 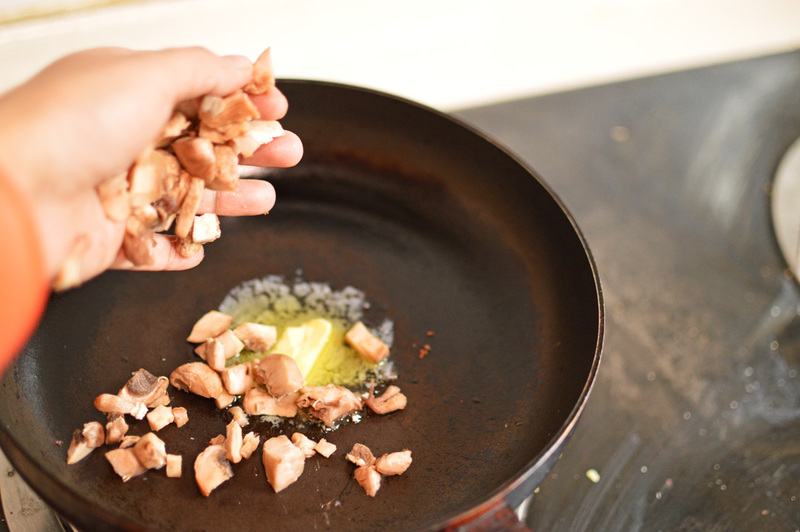 Melt one tablespoon of butter with some oil and add in the chopped mushrooms till they are cooked and their water has evaporated. Add in the chopped onions and pepper and salt and cook for another minute. You don’t have to cook the onions completely. 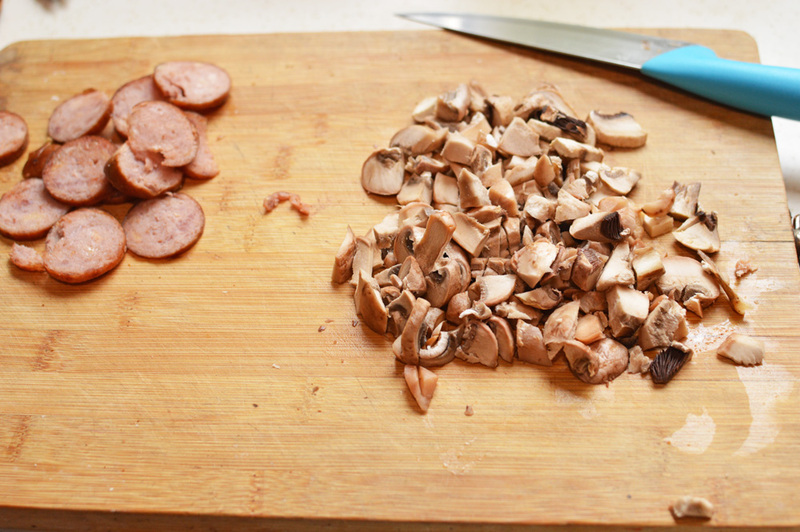 For the assembly, start with layering the cheese, followed by the mushroom onion mixture and then the sausages. Press down a bit after every layer to prevent the formation of any bulges. 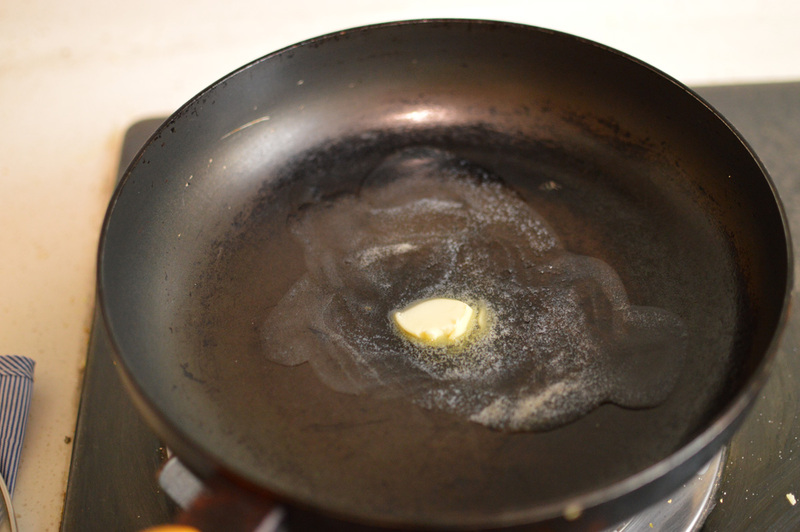 Heat some butter in a skillet and place your sandwich on it and move around to help it absorb all the butter. 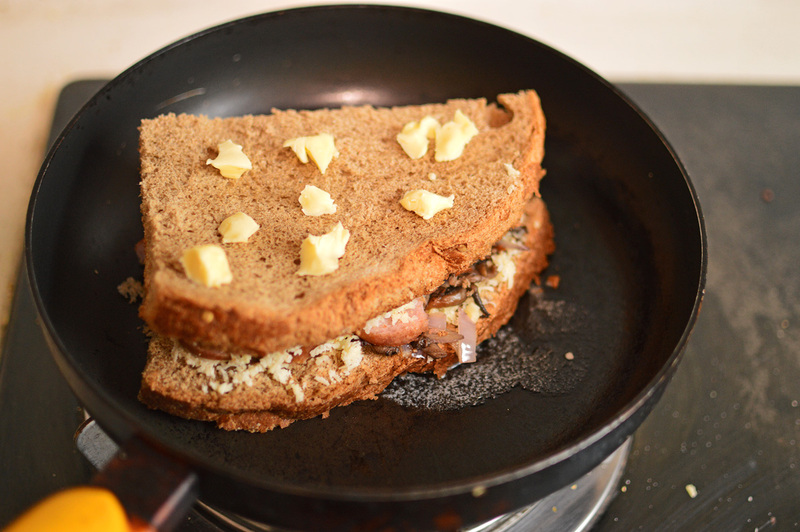 Also butter the top part of your sandwich and once the bottom is nicely browned flip it over carefully. 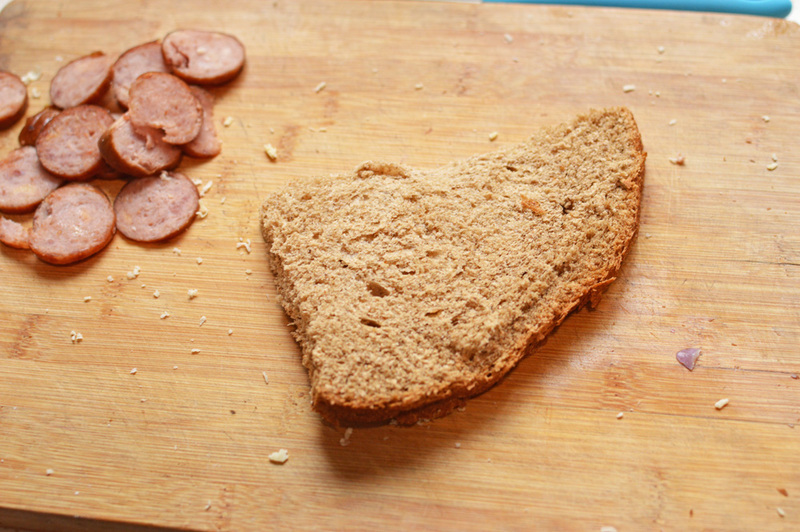 If there is any spillage, you can always push them back into your sandwich. Posted on January 9, 2014 by driedredchilliesPosted in Awesome meal for 1, Comfort foods & weekend mealsTagged cheese, comfort food, meat, sandwich. thank you for such sweet and encouraging comments. It’s best to start a free blog and go from there. Once you know you are really into it you can upgrade it and customize as you want. Yes, of course just as long as you quote/mention the website.